Two days ago, I called my grandmother to ask her about her meatloaf. She has this way of making it that I’ve never been able to duplicate. But she didn’t answer. She usually answers, or if she can’t get to the phone fast enough, she always calls back. But she didn’t call back this time. Maybe she didn’t notice she had a message? Maybe she was out with a friend? But then yesterday I still didn’t hear from her. And I happened to talk to my dad who happened to mention that he had called her and emailed her and she hadn’t gotten back to him. That’s when I got the sinking feeling in my stomach. She lives at Tulipwood in a separate house from my parents, the same house she grew up in. She fiercely protects her independence, sometimes too much. It’s a tricky balance at that age–allowing someone to decide how much independence they want, allowing them their sense of dignity. My parents walked across the lawn, through the flower garden that her mother had planted, past the loud Guinea hens she listens to every day, up the old stone steps, and opened the door with its peeling paint. Grandma P. was on the ground. She had fallen, and usually as sharp as a whip, was not lucid this time. She didn’t want to go to the hospital… it comes back to that whole independence thing. But somehow they convinced her. She was lucid enough to be very specific about which doctor she would see. She wasn’t interested in anyone else. That’s Grandma P. for you. I am praying that she comes back from the hospital, sharp and feisty as ever. There’s so much still to learn from her… I’ve always believed that when people of that generation die, it is like setting the library on fire. 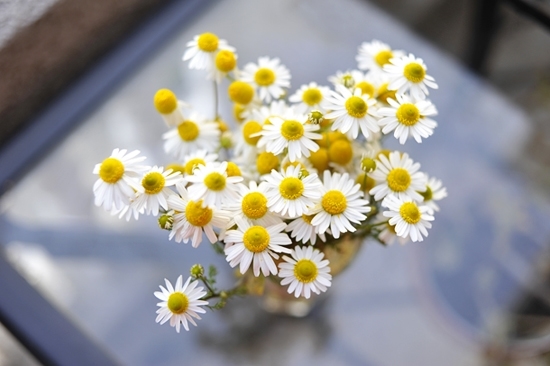 These are the beautiful flowers of chamomile. You can grow them or buy them at the farmers’ market. Simply hang them by a thread until they are dry and brittle. Cut a small square of cheesecloth and about 4 inches of twine. 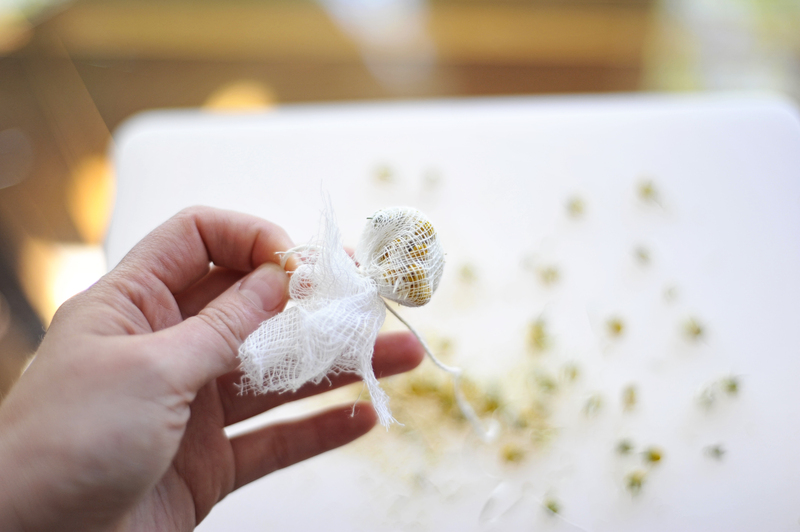 Wrap a tablespoon into some cheesecloth or a tea bag if you have empty ones. Steep in hot water for 3 minutes. 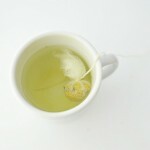 What is it about chamomile tea that is so comforting? 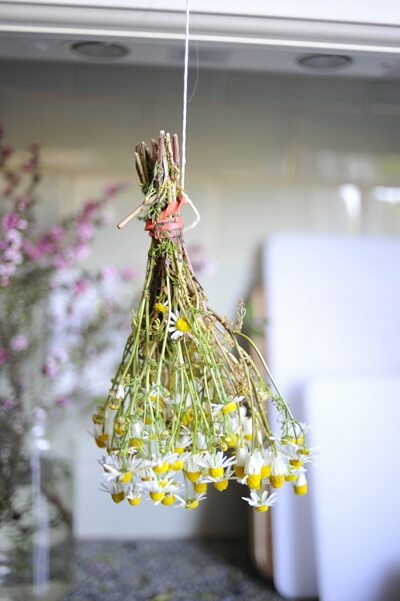 Hang the bouquet upside down by a thread until dry and brittle. 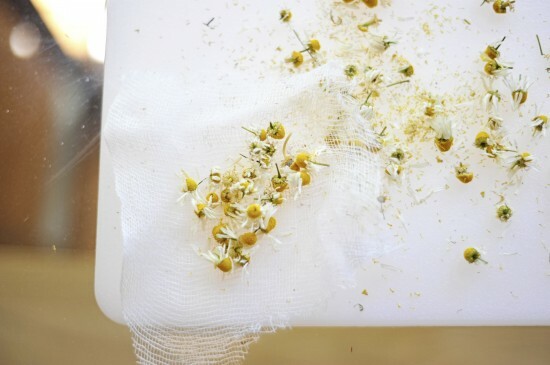 Snip off the buds and place 1 tablespoon of buds into a small square of cheesecloth. Tie it up. Georgia – My thoughts are with Grandma P. for a speedy trip out of the hospital and back in the comforts and cozies of Tulipwood…and a not-so-long wait time for you and the rest of your family. And this line – "I’ve always believed that when people of that generation die, it is like setting the library on fire" – so perfect and true. I'm so sorry to hear this about Grandma P. She's in my prayers. You are so right about setting a library on fire. It is so so so true. You must be terribly worried. What a sweet post and beautiful photography too. I'm praying for her now. I'm sorry to hear about your grandmother. If she's anything like my 87 year old grandma or my fiance's 91 year old "Ba," she'll be running around her herb garden again in a short time like nothing happened. I love your analogy about the library… like the book people in Farenheit 451… when the old go, a treasure of life and lessons goes with them. I hope she recovers ( falls sometimes release chemicals that confuse…even in young people) well and is back making teas and sharing stories. So sorry about Grandma. I took care of my husband's elderly mother for six years. She had dementia and it is so true that finding the line between accepting needed assistance and dignified independence can be difficult. My MIL fell probably a hundred times. She was of very hearty stock like your Grandma and had an amazing ability to bounce back. Your Grandma P. is such a strong woman she may very well do the same. I am so sorry to hear about your Grandma. I hope and pray that she comes back to you soon, right as rain and sharing her priceless wisdom with you and your family. 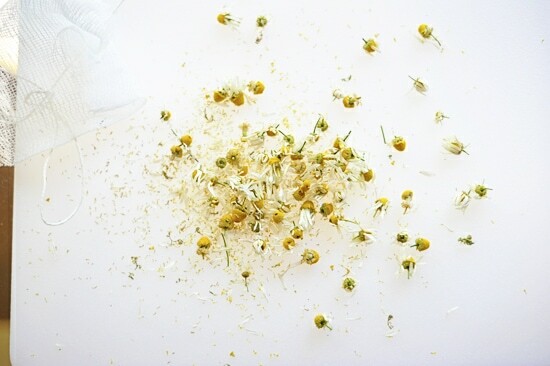 Thank you for so kindly sharing the chamomile tea and beautiful pictures with us. Hope to hear from you again soon! Please know that our thoughts are with you and Grandma P for a full recovery. Please let her know that "your public" cares. Everything about this piece is beautiful. The photographs are stunning. 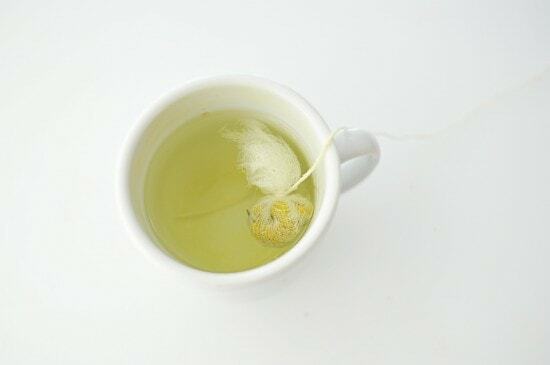 The idea of making my own chamomile tea is lovely. But mostly, the love you have for your grandmother shines through. Please do let us know she pulls through. a very touching piece…growing chamomile in my garden and i will probably always think of your library- on- fire quote whenever i look at them. i think you have inspired me to make chamomile tea with my 13 yr. old budding foodie…time for him to walk into my library. love to your grandmother. I have enjoyed your talks with your Grandma and I hope to be reading about them for a long time to come. Here is to a speedy recovery. You are so right about all the knowledge that our elders have to impart – they are truly precious! My husband's grandfather is like that – he knows more about preserving food, gardening, storing food, etc. than I can ever even hope to read about. I hope and pray that your grandmother recovers quickly! "I’ve always believed that when people of that generation die, it is like setting the library on fire." That was so well-said. I only recently found out that my great grandmother was known for her cooking, and that she passed on all that she knew to my grandmother. I never saw my grandmother in the kitchen often, and just assumed she didn't cook much. I think now of how much I could have learned from her. Your photos are beautiful, but the sentiment in the post even more so. Hoping and praying that your feisty grandma recovers soon. Georgia hope your Grandmother is recovering well. I know exactly how you feel my Nan is 90 in October and still lives in the family home all by herself. My Aunt checks her everyday though and Mum goes at least once a week(different town). Agree with you and the others about lonowledge of the elders being lost. Keep well and hope your Gran is home soon!! !